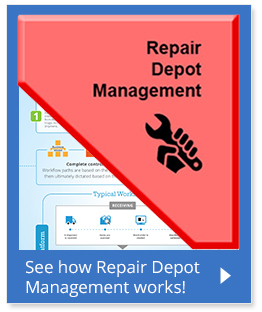 ServiceCentral’s repair depot software supports depot repair operations through extensive customization capabilities. Our repair solutions software facilitates the flow of product through the entire return and repair process, from initial receipt and triage to repair, quality assurance, and shipment. Our depot repair software system features repair workflows built and configured by your own business administrators to support each different business process you need. Whether based on product, customer, line of business, or other defining factor, these workflows can be created and modified via ServiceCentral’s robust administration tools as quickly as your business needs. If your organization needs a robust repair management system, there are many benefits to investing in ServiceCentral’s service management solution. Configure unlimited workflows with our repair depot software, tailoring each service and repair process to match your specific repair depot needs and eliminate extra work. Stay on Top of Inventory. As parts are consumed in the repair process, real-time updates from our repair management system are sent to our inventory management module, InventoryManager™, for complete parts management and tracking. This consumption and availability data across an unlimited number of locations provides the business intelligence needed for improved parts planning and order management. As your service organization goes from day to day, use the data collected in RepairCenter™ to eliminate costly errors by automatically creating warranty claim files. WarrantyManager™ validates, generates, and submits warranty claims according to your configurable specifications. Operate wherever your business takes you with our 100% web-based application and multi-language capability. Our premier hosting facilities ensure operational reliability 24/7/365. We also offer in-house options for hosting your repair solutions software by ServiceCentral. ServiceIntelligence™ reporting gives you a current, comprehensive view of all your service activities. Design, format, and schedule delivery of user-customizable reports to help craft optimized service processes. Dynamic Reports & Dashboards provide an easy, accurate read of everything going on.